 + 71pp., 8vo. In binding with green cloth spine and green paper boards, with 'Verses Written in India' printed on the front. In god condition, lightly aged and in aged and worn binding. 24 poems, with titles including 'The Old Pindaree', 'The Amir's Soliloquy', 'A Rajput Chief of the Old School' and 'Meditations of a Hindu Prince'. 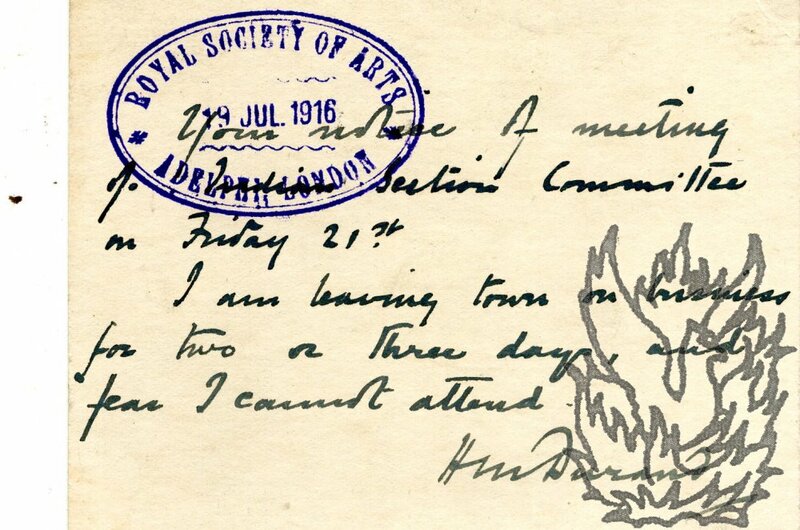 'Verses Written in India' went through six editions, the second to the sixth published between 1890 (K.
Two Autograph Cards Signed (both 'H M Durand') to Sir Henry Trueman Wood, Secretary, Royal Society of Arts. Received 19 July 1916 and 7 June 1917. Both cards plain with printed stamp and 9 x 11 cm. Both bearing the Society's oval purple stamp. 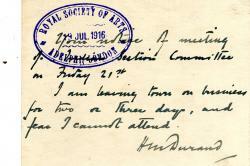 Card One: He is 'leaving town on business for two or three days' and so cannot attend the meeting of the Indian Section Committee. Card Two: He will 'with pleasure support Abney if in town', but may not be there on the day. Engraved election certificate of 'The New York Historical Society', with engraved illustration by Simond, engraved by Durand, of 'The arrival of Henry Hudson on the 4th. Septr. 1609'. Printed on one side of a piece of thick wove paper, watermarked 'G REIG', roughly 53 x 41 cm. Worn and a little spotted and grubby, with creasing and wear to extremities, but good overall, with text and design clear and entire. Handsome boldly designed certificate. Not filled in and with no manuscript additions whatsover. The illustration, an oval roughly 12 x 17 cm, shows the ship approaching white cliffs on shore, with a boat containing seven natives in the foreground.